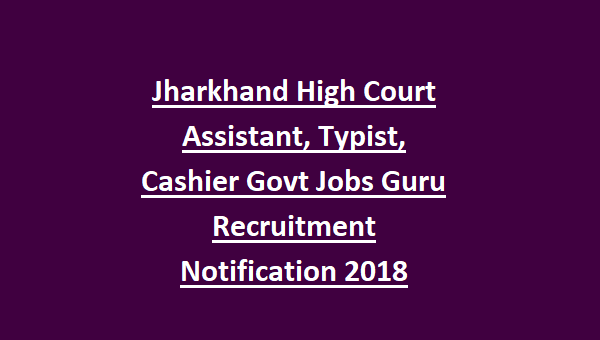 Candidates applying for Assistant & other Jobs at Jharkhand High Court must not exceed the upper age of 35 years and below 18 years as reckoned on 01-08-2018. 1. Assistant: Graduate from recognized University having knowledge of working on computers with sound knowledge of typing in computer. 2. Assistant Librarian: Graduate in Library Science from a recognized University. 3. Cashier: Commerce/Economics Graduate from a recognized University. 4. Translator: Graduate in any discipline from a recognized University. 6. Typist: Graduate from a recognized University having typing speed of 40 words per minute in English. Preference will be given to the candidates having knowledge of typing in Hindi also. Candidates who have successfully applied for the desired post Department will be assessed on the basis of Written Examination, Viva-voce test and Skill Test. Skill Test will consist of Typist test of 200 words. 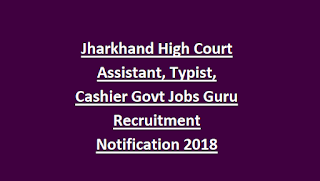 Candidates interested to join Judicial Services at Jharkhand High court at desired Posts can apply online through the official website https://jharkhandhighcourt.nic.in/ before the due date i.e. 23rd October 2018.